As any cyclist knows, carrying objects (groceries, books, tools, bike parts, computers, clothes, and/or camping equipment) on a ride can be challenging. Messenger bags, racks, baskets, and trailers, therefore, are all various attempts at engineering surplus space on/around the bicycle and its rider to maximize comfort and capacity. If panniers are enjoying a recent and healthy relevance among commuting and touring cyclists alike, that might very well be in part because of Swift Industries, a tidy two-person operation out of Seattle [Editor’s note: as you’ll see, Swift has grown wildly successful in the decade since this profile was originally published] and other small businesses like them who are are helping cyclists tote stuff on their bikes. 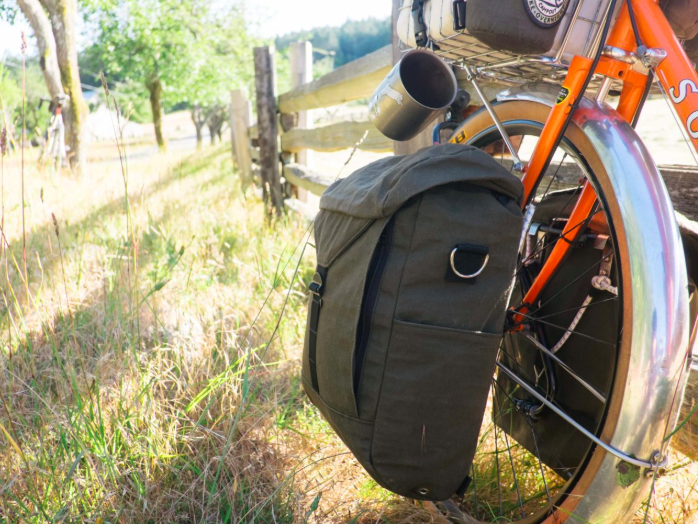 Realizing that a set of well-crafted, waterproof panniers can add a new dimension to one’s daily ride, urban cyclists are adopting rack-mounted carriers traditionally employed more by adventure cyclists. Enter Vulpes velox, otherwise commonly known as the swift fox. Swift Industries’ founders Martina Brimmer and Jason Goods had been riding—and hauling things while riding—for years when they finally wondered, “Wait, why isn’t my bike doing this work for me?” The answer came in the form of panniers they began making in their basement on a secondhand industrial sewing machine. “We liked the stealthiness of the swift fox,” Martina and ‘Goods’ told us over coffee up in Seattle this past winter [Editor’s note: the winter of 2008]. “It’s a lot like people on bikes—their impact is low and they can go just about anywhere they want, even cross-country.” And though the fox isn’t well-known as a pack animal (its cousin the husky, however, is famous for ferrying people around the arctic), Martina and Goods settled on the Swift name and logo in part because of Vulpes velox’s migratory nature. Before any of this, though, Martina and Goods got their start in 2005 at a free community bike space in the small southwestern mountain town of Prescott, Arizona. There, with a few others, they helped start Helping Understand Bicycles (HUB), where services, women’s workshops, and projects were offered aiming to help immigrants and the homeless acquire and maintain personal transportation options. The first set of Swift Industries panniers went out in March 2008. Shortly thereafter, Chicago’s One Less Car ran a review of their work, and then The Bicycle Paper featured a story on the duo, as did Box Dog Bikes in San Francisco. But they knew it wouldn’t take long for companies to catch on and felt they had to do something unique, so they began making fully-custom panniers to spec on each order. “You’re just more certain that they are getting what they want, and what they’ll use,” Martina explained. Swift’s signature design is a roll top pannier [Editor’s note: Swift’s product line has evolved since the early days, too], made of grey vinyl and cordura from Minneapolis, with the rest of the material acquired from a mom-and-pop distributor in Idaho called Outdoor Wilderness Fabrics, an independent business who works with smaller manufacturers like Swift. “Shhh,” Martina added, “we dumpster dive for some fabric, too, but we obviously can’t disclose from where.” In keeping business “in the family,” as they say, Swift got its pannier hooks from Haulin Colin (who makes trailers, cargo bikes, and the like), and its screen-printing done by The Grimeline Collective, both Seattle-based. “It’s just that I have a problem,” Martina concluded. “I just keep acquiring material and fabric from everywhere—thrift shops, or anywhere I can find it.” But, like a sleek fox who doesn’t carry any more than it needs, Swift makes accessories from all its scraps, including two different sized tool pouches and a small sort of pocketbook, and as such, produces very little waste in sum. Seeing as how they constantly think about the environment, it’s no surprise to learn that Jason, who holds degrees in adventure education and environmental science, also works at Revolution Cycles in Seattle and is also a “professional naturalist,” while Martina, whose college major was agro-ecology with a minor in social justice studies, works as a director of an after school program. This past winter , Jason taught courses in wilderness education and Martina took twelve college students to Bolivia. With their relative initial success, it seems Swift will most likely just keep moving. “I would love to sew full time,” Martina says. “That would be amazing and empowering.” For now, though, the foxes still work their day jobs, but by night are in their den, toiling in almost total solitude, quietly making near perfect panniers for the utilitarian cyclist, one by one.